The HealthPath Foundation of Ohio (HealthPath) recently awarded $112,000 in grants to 14 organizations dedicated to improving community health in western Ohio. CINCINNATI, Ohio (April 16, 2019) – The HealthPath Foundation of Ohio (HealthPath) recently awarded $112,000 in grants to 14 organizations dedicated to improving community health in western Ohio. The grants are part of HealthPath’s Community Connections initiative, which awarded 20 grants this year totaling $160,000 to Ohio nonprofit organizations. The grants offer general operating support of $8,000 over two years, or $4,000 per year. The 2019 Community Connections initiative focuses on organizations that have strong community engagement strategies and achieve one of HealthPath’s results areas of Cavity-Free Kids to ensure Ohio’s children ages 0–12 have healthy mouths; Healthy Ohioans to ensure residents have access to the resources they need to be healthy, including access to care and healthy food; and Safe Elders to ensure older adults living in the community are supported and safe from abuse, neglect and exploitation. Since the Community Connections program began in 2012, HealthPath has awarded almost $1.5 million through 176 grants to organizations throughout Ohio. The HealthPath Foundation of Ohio (HealthPath) is committed to helping all Ohioans, regardless of status, wealth or circumstances, achieve their fullest health potential. HealthPath works within a 36-county region to achieve the results of Cavity-Free Kids, Healthy Ohioans and Safe Elders. Since 1999, HealthPath has invested more than $18 million in community projects that address health issues faced by Ohioans. For more information, visit www.healthpathohio.org. CINCINNATI, Ohio (April 16, 2019) – The HealthPath Foundation of Ohio (HealthPath) recently awarded $64,000 in grants to eight organizations dedicated to improving community health in southeast Ohio. The grants are part of HealthPath’s Community Connections initiative, which awarded 20 grants this year totaling $160,000 to Ohio nonprofit organizations. The grants offer general operating support of $8,000 over two years, or $4,000 per year. (March 2018) The HealthPath Foundation, in partnership with a group of philanthropy organizations, has released a new report, Our Pathway to a Brighter Future: Ohio’s New Americans, revealing that immigrants play a crucial role in Ohio’s economy and that further investments in services for immigrants would expand positive outcomes. a full-range of healthcare services that are available regardless of legal status and that address physical, mental, and oral health. Supporting immigrants creates benefits for native-born Ohioans. Immigrants are more likely to fill physically demanding and emotionally draining jobs in high-demand fields such as home health care, catapulting native-born Ohioans into more skilled labor. As Ohio’s population ages, immigrants will play an important role in filling jobs for the estimated 1.1 million personal and home health care providers needed in the United States by 2026. Ohio’s immigrants have higher rates of family formation than native-born Ohio households, with 62.2 percent of immigrant households comprised of married couples with children compared to 56.4 percent of native-born. While Ohio’s population growth is almost stagnant, growing at only 0.15 percent since 1998, immigrants help to stabilize Ohio’s population and are a source of growth. Still, only 4.4 percent of Ohio’s population is composed of immigrants compared to 13.6 percent of the U.S. population. This is the largest divide between Ohio and the nation in modern history, and ranks Ohio in the bottom five nationally. Our Pathway to a Brighter Future: Ohio’s New Americans is the result of a collaboration of funders coordinated through Philanthropy Ohio. It was funded through the generous support of The George Gund Foundation, The HealthPath Foundation of Ohio, Needmor Fund, Ohio Legal Assistance Foundation, Open Society Foundations and SC Ministry Foundation. Wednesday, May 10, 2017 | 11:30 a.m. - 1:15 p.m. Registration to begin at 11 a.m. The event is free to attend. Please RSVP by May 3 by clicking here. Please join us as we announce HealthPath's 2017 Community Connections grantees and the 2017 Community Connector Award winner. At the luncheon, you will hear from Keynote Speaker TaKeysha Sheppard Cheney. She serves at the director of Community Engagement for Molina Healthcare of Ohio, a subsidiary of a FORTUNE 500, multi-state health care organization that arranges for the delivery of health care services to individuals and families who receive their care through Medicaid, Medicare and other government-funded programs. As director, Cheney oversees strategic community partnerships and sponsorships that ultimately contribute to enrollment growth and the engagement of current members. Following the luncheon, meet colleagues and learn more about who is working in the issue areas and counties you are interested in during a brief networking session. Breakout Sessions - 1:45-3:25 p.m.
For more information, visit our Community Connections page. CINCINNATI (May 24, 2018) - The HealthPath Foundation of Ohio (HealthPath) recently awarded $30,000 in grants to four organizations dedicated to improving community health in northeast Ohio. The grants are part of HealthPath’s Community Connections initiative, which awarded 22 grants this year totaling more than $155,057 to Ohio nonprofit organizations. The grants will be used over a two-year period. Holmes County General Health District (serving Holmes County): The Getting Active Staying Strong Project will provide adults ages 65 and over an opportunity to engage in safe physical activity while in an outdoor setting, promoting an increase in strength and endurance, and a decrease in chronic health issues. Youngstown Neighborhood Development Corporation (serving Mahoning County): Safety and fitness programming will be instituted at Youngstown’s Summer Day Camps at six city playgrounds in conjunction with the Safe Routes to School program. The Salvation Army - Canton, Ohio (serving Stark County): The Seniors Program at The Salvation Army of Canton, Ohio, offers adults ages 55 and older the opportunity to socialize, learn and stay active in a safe environment where they receive a healthy meal and support. Family & Community Services Inc. (serving Trumbull County): SCOPE Senior Services 'Travelling Pantry' provides free basic groceries and fresh foods delivered by volunteers to homebound and shut-ins located in the food deserts of the City of Warren located in Trumbull County, Ohio. Since the Community Connections program began in 2012, HealthPath has awarded more than$1.45 million through 176 grants to organizations throughout Ohio. For more information or for a full list of 2018 grantees, visit www.healthpathohio.org. CINCINNATI (February 25, 2014) – The HealthPath Foundation of Ohio (HPF-Ohio) has awarded nine Strengthening Ohio’s Safety Net (SOSNet) Grants, totaling more than $1.4 million. These grants are designed to improve health care access for underserved populations within HPF-Ohio’s 36-county service area, with a primary focus on rural areas. They will enhance the distribution and diversity of the healthcare workforce, including primary care doctors, dentists and advanced nurse practitioners. The following organizations received grants totaling $362,500 to launch the Lutheran Ohio Advanced Education in General Dentistry Residency Program at dental clinics located in Cincinnati, Findlay and Lima, Ohio. Humility of Mary Health Partners – planning grant to develop a rural training track for dental residents in Columbiana and Carroll counties. Northeast Ohio Medical University – support to launch the Health Professions Affinity Community program in high schools located in Monroe, Noble and Washington counties. University of Cincinnati – planning grant support for pipeline programs in the Colleges of Nursing and Medicine. Wright State University Boonshoft School of Medicine - planning grant support to develop a rural health training track for medical students. Youngstown State University – support to launch the Health Professions Affinity Community program in high schools located in Mahoning and Trumbull counties. In addition, HPF-Ohio awarded a grant in the amount of $500,000 to Ohio’s Finance Fund to establish the Community Health Loan Fund. The fund provides flexible financing for eligible health and wellness-related projects serving low-income communities. The Finance Fund recognized the HPF-Ohio in 2013 with the inaugural Visionary Funder Award. The award was created to recognize a funder for their significant support of a Finance Fund program that brings meaningful change to underserved communities. Other funders contributing to the CHLF include The Greater Cincinnati Foundation, Interact for Health, PNC Bank and the Ohio Development Services Agency. 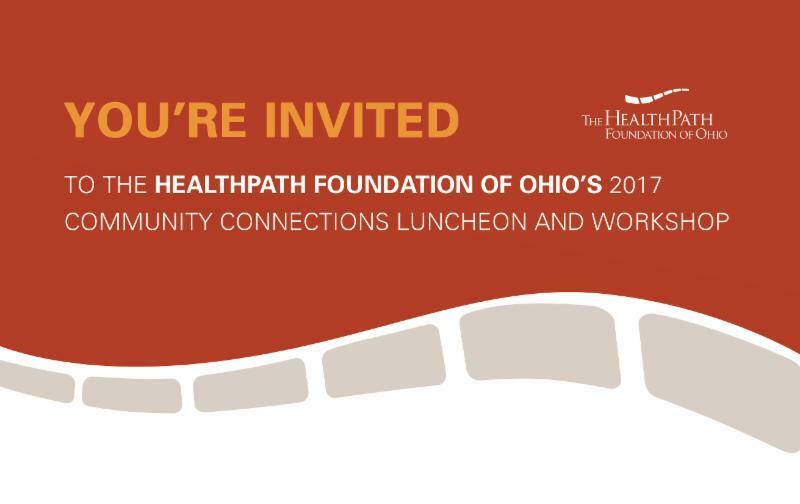 (October 21, 2016) - The HealthPath Foundation of Ohio is hosting two Pre-Application Workshops to discuss our Community Connections funding opportunity for 2017. Recognizing that changes in health and healthy behaviors can only come about if they are rooted in a local community's strengths, HealthPath's 2017 Community Connections initiative will focus on supporting communities as they identify the changes they want to see and work to reach their goals. We want to empower community residents to build on their strengths and address the needs of their neighborhoods, towns, schools, parishes, and communities. HealthPath's Community Connections initiative will fund community-driven projects designed and developed with direct resident input. Health and social service care providers, neighborhood clubs or groups, social and civic organizations, youth groups, school groups, 4-H clubs, scout troops, senior centers, faith-based organizations, colleges or universities, school districts, and other organizations are eligible to apply. The organizations must be located in and/or primarily serving the highlighted 18-county service area below. Counties include: Allen, Auglaize, Belmont, Darke, Hancock, Hardin, Harrison, Jefferson, Mercer, Miami, Monroe, Montgomery, Noble, Preble, Putnam, Shelby, Van Wert, and Washington. HealthPath counties not included in this list will be eligible to apply for Community Connections funding in 2018. HealthPath will be holding two Community Connections workshops. During the workshops, attendees will learn more about the Community Connections funding opportunity, including what we're looking for to fund, who is eligible and how the application process works. UHCAN Ohio will also provide training on how to develop a community-driven project. Please RSVP by Friday, November 25, via the link below. If you have any questions, please contact Christine Mulvin at mulvinc@gcfdn.org or 513-768-6117. Not only are we providing grant funding, we are also seeking community members to help us decide what projects get funded. Volunteers on our Community Connections Grant Proposal Review Committees will make recommendations about which projects to fund, learn more about community efforts, and network with others in their regions.